The Tablet from Gradeshnitsa contains 4 rows of pictographic signs, which are quite clearly visible upon the tablet’s photograph (exhibit A). They are presented in a computer enhanced version and in a schematic drawing, respectively in exhibits B and C. (N.B. If there have been any other additional signs on the artifact, that are presently not visible or discernable, these have not been taken into consideration for the purposes of our present reading of the text). 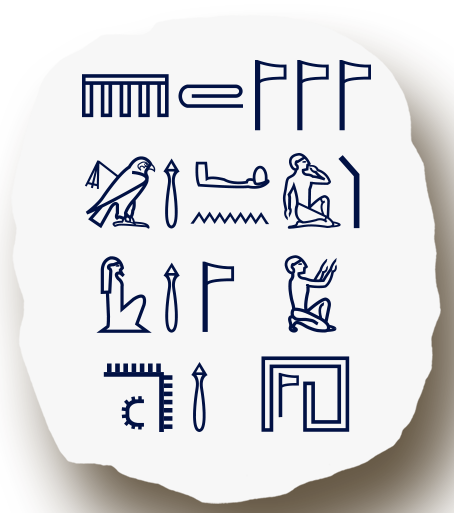 The above identified pictographic signs look exactly like the Hieroglyphic Inscription presented as exhibit D, when they are transcribed using the stylized later version of the pictographic script, known to us from the pyramid texts of Ancient Egypt, beautifully rendered here in its computerized calligraphic print. 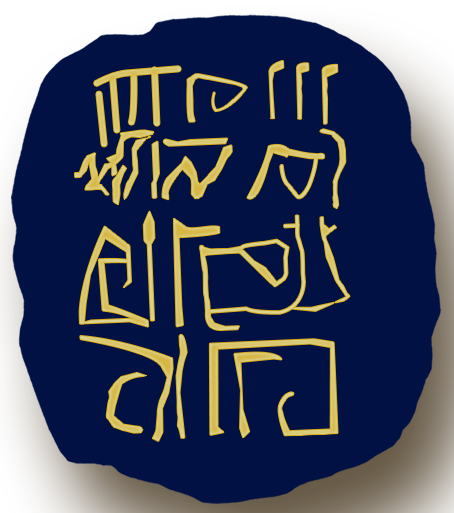 Upon comparison, it becomes evident that the text displayed on exhibit B, exhibit C and exhibit D, is absolutely one and the same identical text, and that the two calligraphic styles (respectively – the early Thracian, and the late Egyptian), represent one and the same identical pictographic script, which has come to us down the ages in its condition and appearance as seen on Exhibit A. The Script used in the engravings upon the Tablet of Gradeshnitsa, found in the land of Ancient Thrace (present-day Bulgaria) and the Scripts used in similar tablets and in the pyramid texts, found in Ancient Egypt, represent one and the same IDENTICAL Hieroglyphic Script! 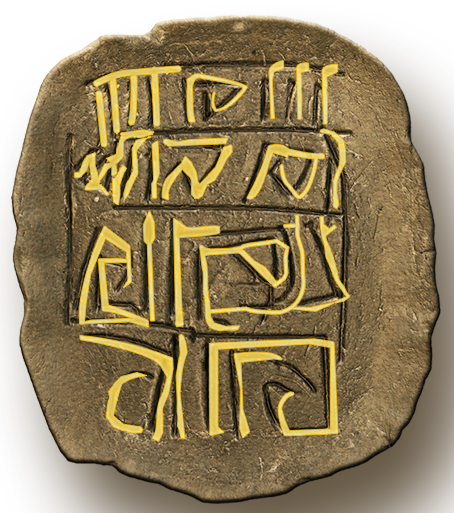 The Tablet from Gradeshnitsa, found in the land of Ancient Thrace, predates similar artifacts found in Egypt by at least two millennia. 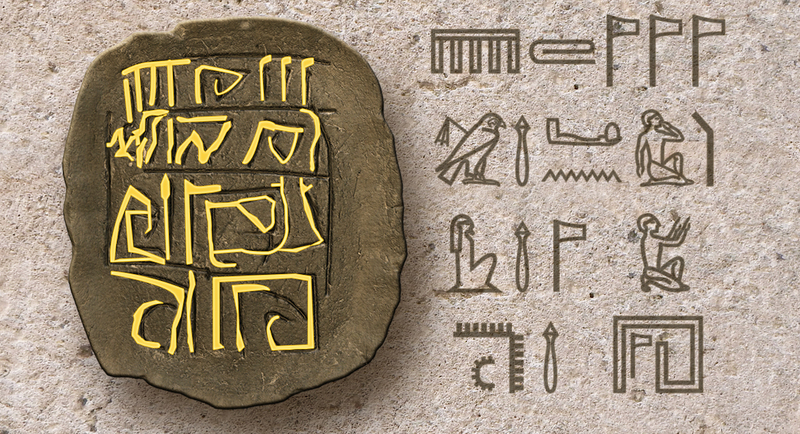 Apparently, this particular type of Hieroglyphic Script had originated and was first used in Ancient Thrace, and it was later transferred and introduced in Ancient Egypt. The Early-Thracian version of this Hieroglyphic Script was evidently used quite sparingly – predominantly as the Sacred Language of the Initiated Elite. It doesn’t appear from the findings so far, that it ever reached the levels of wide spread utilization, which it found thousands of years later in its Late-Egyptian version. O God, who are in your temple, be my fortress and defend me (deliver me from the enemy)! (3) And only you (shall) I praise (and exalt), O my God (for you are) great! (4) You who are now in your temple, (I pray, hear me), keep me safe and deliver me (from all evil)! More detailed information about the Gradeshnitsa Plate and its reading is, of course, found in the First Book of this series – The Thracian Script Decoded – I, where a more thorough analysis of the text of the Votive Plate and its meaning was introduced. 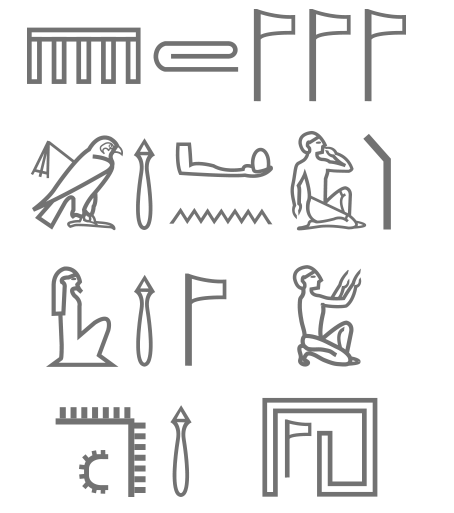 A unique fact about the Gradeshnitsa Plate, which was not mentioned in Book I, but become aparent with Book II, however, deserves some special attention, as it brings further curiosity into the meaning of its textual contents, especially the last row of pictograms that contain the hieroglyphic sign meaning “Temple (House) of God”; or “God, who is in his Temple”, composed of two hieroglyphs respectively: meaning “God” and pronounced “Nooty”**, and , which in the text translates as “Temple” and was pronounced as “Orphei”** / “Erphei” in the north of Egypt and is so preserved in the Boharic Coptic Egyptian dialect used in the Christian Liturgy to this very day! For the English speaking reader this may not ring immediately any bell, but on the Balkans the word “Orphei” is identical with the original pronunciation of the name of the Legendary ORPHEUS who was the Thracian Patriarch equal to what Moses was to the Jews, and several independent of each other ancient traditions attribute to him the foundation of both the ancient Dyonisian Religion and the Orphic Mysteries, as well as the essentials of all ancient Temple-worship, Temple-music and Temple-ritual, that have influenced all religious practices from his time to this very day! No wonder his own personal name became so closely related to the ancient concepts of Temple and Temple Practices that it became synonymous with the ancient word for “Temple” both in the Thracian speech and in the Boharic North-Egyptian dialect which must have been most closely influenced by the Thracian dynasties, who had ruled in the Delta region, as was explained in Book I of this series. The legendary Patriarch of the Thracians – Orpheus – may have actually lived around the time the Tablet from Gradeshnitsa was made, and may have been just like his later counterpart among the Jews – Moses-the Mediator of the Ancient Covenant between God and His People ( in our case the Thracians)! This qualifies the later Greek myths about Orpheus as a much later corrupted version of the real biography of the First Orpheus, or maybe even a reflection of a biography of a different much later descendent of the Patriarch of Thrace bearing the same honorable name as his Great Forefather, just like many Moses’es among the Jews today bear the name of the legendary Patriarch of the Jewish nation – the First Moses! 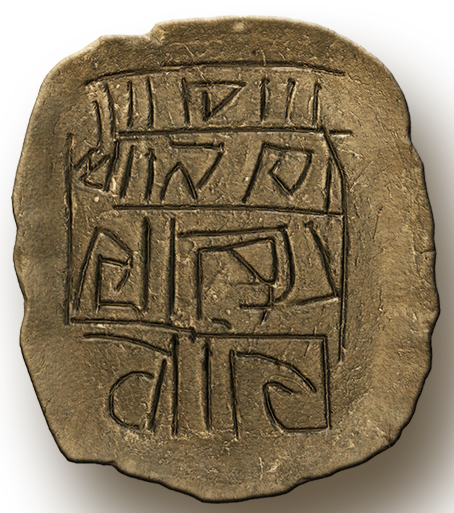 Since the Votive Tablet from Gradeshnitsa has the form of a Legal Contract, i.e. Covenant between God and Man, as was analyzed in greater detail in Book I of our series The Thracian Script Decoded, and since the name of ORPHEUS is pictographically represented on it as the hieroglyph of the “Temple” (“Orphei”), and therefore may be considered as the signature of the Ancient Patriarch, this could be rightfully viewed as the Tablet of the Orphic or rather Orpheic Covenant between God and the Thracian people, similarly to the much later version of the Two Tablets of the Mosaic Covenant between God and the Jewish people. The tablets from Gradeshnitsa and Karanovo, however, are definitely not the only existing artifacts of that nature found on the territory of Ancient Thrace! There are a number of other similar tablets (plates) well known to archaeologists, which date from relatively the same historical period (of 5000 to 4000 BCE) and were found within the borders of the same extended geographical region. Without going into all the technical archaeological details of such finds in this predominantly linguistic research work, it will suffice for us to state, that our analysis conclusively demonstrates, that the tablets found to the north of Gradeshnitsa (Bulgaria) – in the region of Tartaria (modern day Romania), display pictograms of the same Thracian pictographic script, identical to the one already decoded by using the Guide Method, upon the Tablets from Gradeshnitsa and Karanovo (Bulgaria). * At the time of the First Edition of this book, the original Tablet of Gradeshnitsa was in the keeping of the Vratsa Regional Museum of History, in the city of Vratsa, Bulgaria.